Having been heavily effected by high winds in 2016, the 2017 Shuttleworth Collection Edwardian Pageant was blessed with a bit more luck. 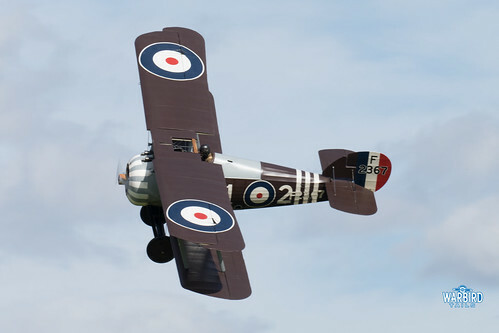 A large number of the WW1 aeroplanes were able to fly alongside a number of family favourite acts. One of the WW1 displays will be fondly remembered by many in attendance. The display started with the Bristol F2b lumbering into the sky in a way that only such an aircraft can. The F2b was then joined by the SE5a making its first Sunday show appearance of 2017 (The SE5 only rejoined displays following engine work at the July evening show as shown in the photo below). 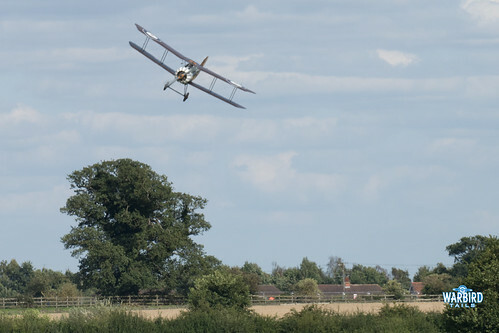 Watching these two original First World War machines fly together is always an incredible sight with the SE5a representing the pinnacle of WW1 fighter technology and in many ways a clear sign of fighter development to come. The Bristol F2b is simply an incredibly impressive aeroplane, the sheer size of the design is impressive enough but when combined with the gentle purr of the Falcon engine and its graceful display sequence makes for something utterly unique. 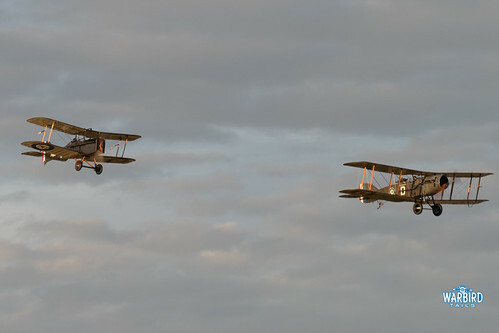 While unquestionably unique in global terms, the sight of these two airframes in the sky together is not all that unusual at Old Warden. It was the sight of the third aircraft in this display that earns a place in “Airshow Moments”. 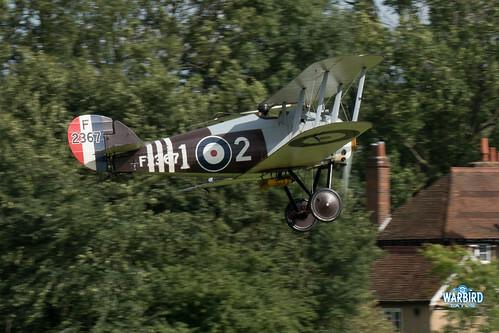 While the SE5a may have represented the start of the new way of thinking about fighter designs, Sopwith still had one final stand for the rotary scouts. Much like designs such as the Gladiator, Bearcat, Sea Fury etc there is always a “Full Stop” an extra few lines on the end of a chapter. 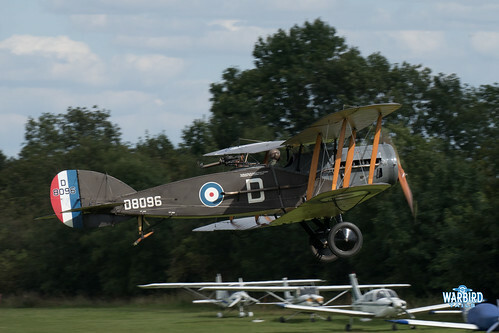 For the rotary fighter designs that full stop was most certainly the Sopwith Snipe. Those who attended shows at Stow Maries in 2016 will know first hand how impressive the Snipe is. The aircraft is powered by an extraordinary 230hp Bentley BR2 rotary engine which results in incredible performance.Amazingly this display was the Snipe’s first solo performance at Old Warden since its debut back in 2015. Ahead of a spectacular solo performance the Snipe joined the SE5a and F2b for one of those classic, never-ending tailchase sequences. It was stunning to see the Snipe having to perform wide, arching wingovers around the SE5a and F2b simply to stay in position. I don’t think many would have believed a Snipe would ever be flying at UK airshows, let alone as part of such an impressive sequence. This routine was followed by a classic Snipe solo from Jean Munn, in the short time the Snipe flew at UK airshows this combination of man and machine rightly earned their spot in airshow history. There is something perfect about those Snipe displays and on that sunny August day at Old Warden there couldn’t be anything better. Low, sweeping passes, combined with close turns around the bend made for long lasting memories. Although not known at the time, this would turn out to be the Snipe’s swan-song in the UK as it was shortly returned back to New Zealand. I can’t think of any better way for the Snipe to say goodbye and I can’t thank those involved enough for brining this extraordinary machine to this country. 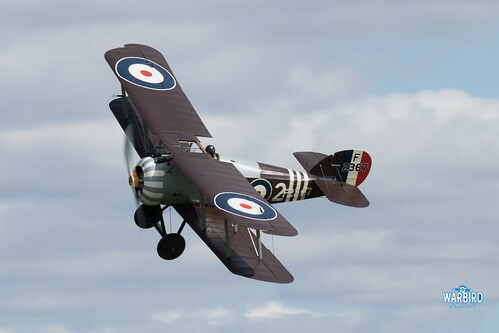 The Snipe was operated in the UK by the WW1 Aviation Heritage Trust based at Stow Maries. The Trust are currently fundraising to bring back the Albatros and an SE5a for the 2018 season – you can donate by clicking here.